The EP-3/4 sold for $489 originally, but now commands three times that price on the second hand market. Branded as the "Maestro" Echoplex after its distributor, this seminal tape echo device was developed by Mike Battle and Don Dixon after a design created by Ray Butts, whose tape-based echo had featured in a guitar amp called the Echosonic, favoured by Elvis Presley's guitarist Scotty Moore ("Mystery Train") and Sam Phillips. The Echosonic was never produced in any great numbers, but it did help to shape the burgeoning sounds of both rockabilly and Nashville. In 1961, Battle took the idea and stuffed it into its own cabinet, complete with an enclosed tape cartridge, tube-based amplification and the ability to slide the playback head in order to adjust the timing of the repeats. 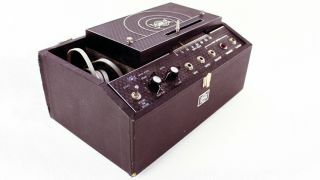 It was a breakthrough idea, and the Echoplex EP-1 (as it would later be known) and its follow-up, the EP-2, were runaway successes, and not just for their intended purpose - many guitarists found that the Echoplex added a rounded, woody tone to their signals, even without the echo in play. The echoes themselves were brimming with analogue flavour, brutally filtered as they fade into the noise floor. Cranking up the Repeats knob results in an instantly recognisable squall of echoes feeding back into the signal path. This is dub heaven made manifest. The EP-2 is undoubtedly the classic. Patented by Market Electronics and distributed by Maestro in 1962, these units are now highly sought-after. The solid-state follow-up, the EP-3, was slow in coming - Battle preferred the tube-based model and would eventually sell his interest in the company. Yet the EP-3 was not without its own unique qualities. It added a sound-on-sound feature, and later units provided built-in compression. The follow-up EP-4 dropped the sound-on-sound feature and eventually the compressor circuit, too. The Echoplex was hugely influential, being a standout component in the rigs of many a legendary player. Its exquisitely filtered echoes can be heard on countless records by Led Zeppelin, Joe Walsh, Queen and Van Halen. Andy Summers of The Police used it as a tube-based filter. Neal Schon, Randy Rhoads, Joe Satriani, Neil Young… the list of users is a Who's Who of Rock and Roll. Needless to say, many traditionalists are not enamoured of digital recreations, either soft or hard, though the Gibson/Oberheim Echoplex rackmountable looper was pretty nifty, in its creamy white finery. Released in 1990, it would be the last for some time to officially carry the name, even if it had little to do with the original. These days, those desirous of the classic Echoplex sound are spoilt for choice, assuming they're willing to shake free of any luddite tendencies. Some of the very first plugins were designed to emulate the sound of tape-based echoes, and some DAWs bundle them in. You can, of course, roll your own by simply applying a filter or EQ and a tape saturation effect to the wet signal of any old delay. Today, Dunlop offer hardware-heads a solution in the form of the EP101 Echoplex pedal, a tapeless recreation of the EP-3. If you happen to own any of Universal Audio's UAD hardware, you can avail yourself of the spot-on EP-34, a clone of the solid-state models in the Echoplex product line. It has all the features and glorious flaws of the original units (barring the awful noise reduction circuit) plus modern conveniences like tempo sync. Though not a direct copy of the original Maestro Echoplex, Steinberg's free Karlette could itself almost be considered vintage, having been released well over a decade ago. It was recently revamped and re-upped for duty. Four tape heads and tempo sync offer abilities not found on the original, and hey, it looks good, too! Again, not a 1:1 clone, but this 32-bit Windows plugin will only set you back a few bucks and boasts realistic tape flutter effects, MIDI automation and a warm, faux tube sound. A healthy selection of controls are available. Built with Flowstone, a modular plugin creation environment formerly known as SynthMaker.